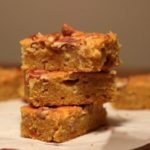 A recipe for a delicious pumpkin pecan sheet cake perfect for the fall and holiday season. Preheat the oven to 350º. Butter and flour 15x18 inch baking pan. In a large bowl beat butter, gradually add brown sugar and beat until light and fluffy. Add eggs, one at a time, beating well after each addition. Add vanilla. Add flour, baking powder, spices and salt and beat until just mixed. Beat in pumpkin puree. In a medium bowl mix sour cream, sugar, yolks and cream. Drizzle mixture on top of cake batter and swirl with a knife. Sprinkle pecan on top and bake 30 to 40 minutes, until a tester inserted in the middle of the cake comes out clean. Let cool on wire rack. Cut into squares and serve. Recipe adapted from Bon Appetit. This recipe can easily be halved and baked in a 8-inch square pan.